Age 88 of Owosso, went home to be with her Lord,Wednesday, February 6, 2019 at Memorial Healthcare. Funeral Services will be held at 11am Saturday, February 9, 2019 at Salem Lutheran Church with Pastor James Bare officiating. The family will receive friends at Nelson-House Funeral Home, Owosso Chapel on Friday from 2pm to 8pm and on Saturday at the church from 10am until the time of the service. Betty was born March 12, 1930 in Brant; the daughter of Herbert L. and Anna (Kostor) Frasier. She graduated from Owosso High School and was a member of Salem Lutheran Church where she taught Sunday School and served on the Altar Guild. Betty married J.C. Williams on October 17, 1953 at Salem Lutheran Church. Betty loved to help others and being involved in her grandchildren's lives and school activities. She retired from General Motors after 30 years. 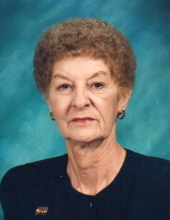 Betty is survived by her husband J.C.; daughter Terry (Jeffery) Barancik; grandchildren Tara (Randy Painter) Barancik and Clayton Barancik; four sisters Lorraine Sedlar, RuthAnn (Fred) Toma, Sharon Cambal, and Dorothy Saulnier; several nieces and nephews and many other loving family and friends. She was predeceased by her parents; many sisters-in-law and brothers-in-law. Memorial Contributions are suggested to Salem Lutheran Church. To send flowers or a remembrance gift to the family of Betty Gene Williams, please visit our Tribute Store. "Email Address" would like to share the life celebration of Betty Gene Williams. Click on the "link" to go to share a favorite memory or leave a condolence message for the family.